The Egyptian coastline stretching along the shores of the Mediterranean Sea 110 km from the city of Alexandria is considered as one of the most beautiful areas along the coast. Set in a broad and barren desert plain somehow too distant from the seafront, is the small village of El Alamein. Meaning 'two worlds' in Arabic, El Alamein's history and geography conspire to allow the town to live up to its name. It was here in November 1942 when the Allied forces under the command of British General Montgomery put a halt to the advance of Nazi Africa Corps who considered El Alamein the gateway to Alexandria and the key to the control of the African continent. The Allied victory in the battle of El Alamein marked the beginning of the end for the Axis Powers in North Africa, crushing the mystique surrounding the "Desert Fox", German Field Marshal Rommel, whose force of tanks had previously proved invisible. The Battle of El Alamein was one of the most violent as well as most important confrontations during 2nd World War. 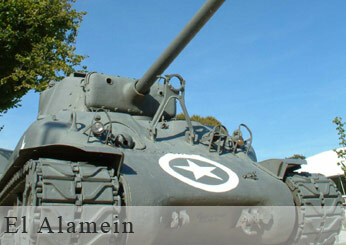 Your first stop will be at the Military Museum containing displays of weapons, military garb and tanks. Descriptions of the actions of Montgomery, Rommel and the others participating in the battle are also on display. Continue your tour with a visit to the burial site. A short drive west of town, perched on a small peninsula overlooking the sea, the citadel-like Cemeteries is the final resting place for Commonwealth, Greek, Italian and German soldiers. The neat rows of tombstones provide a poignant scene set against the seemingly interminable desert. Within a shaded alcove, the inscribed plaque explains the significance of the battle as well as the diverse origins of the victims interred here. The drive to El Alamein lasts for approx. 75 minutes each way. A fee must be paid for using the Camera and/or video at the Military Museum.